When you order a Jen D Designs gi, you can sleep better at night knowing that you are supporting an independent craftsperson, paying a living wage, and avoiding mass produced sweatshop gis. You are also taking the middleman out of the transaction by ordering directly from the maker. In addition to all this, your gi will fit you, made to your measurements, and you will look and feel great wearing it. A Jen D Designs gi will last considerably longer than those cheap cotton uniforms you are probably used to and you will have a smaller carbon footprint because of its durability and reparability. “The top fits fine but the pants are not big enough for my height”. “I train a lot and lightweight cotton gis wear don’t last”. “I want a gi that’s not made in a sweatshop on the other side of the world. I can tell that this one was made by someone who doesn’t train in martial arts”. 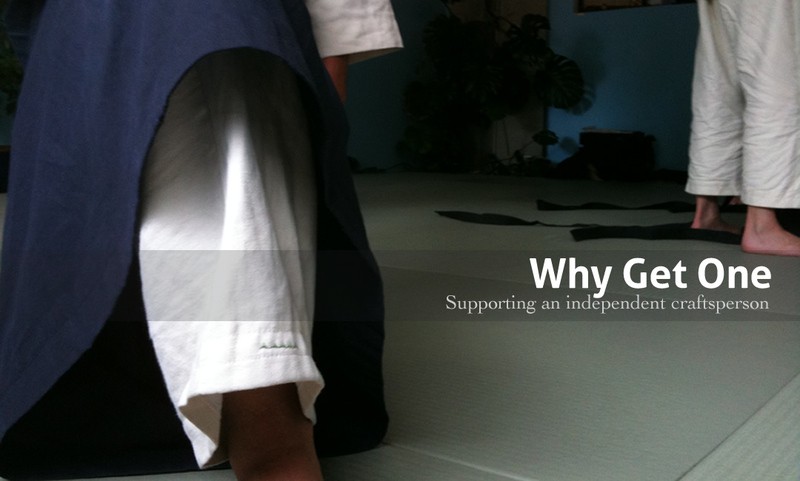 “My gi doesn’t fit well, and needs frequent adjustment, which is distracting during training”. “The heavy cotton is stiff and irritates my neck, and is sheer torture in this ninety percent humidity”. All these problems are eliminated by ordering a Jen D Designs gi. It will be made to your specifications out of high quality fabric right here in California. Jen sews all her gis with double sewn seams and a strict attention to detail. She has put a lot of thought into the design, coupled with her over fifteen years of Aikido training. All points of contact with the body are as flat and smooth as possible to prevent any irritation or potential injury. Your gi will come with a 2 year warranty. Any needed repairs during the first 2 years of ownership will only cost you shipping. After 2 years, I will only charge a moderate amount for simple repairs. The expected life span of a Jen D Designs gi is 8 to 10 years of good wear. If you only train 2-3 hours a week, life span could be much longer.